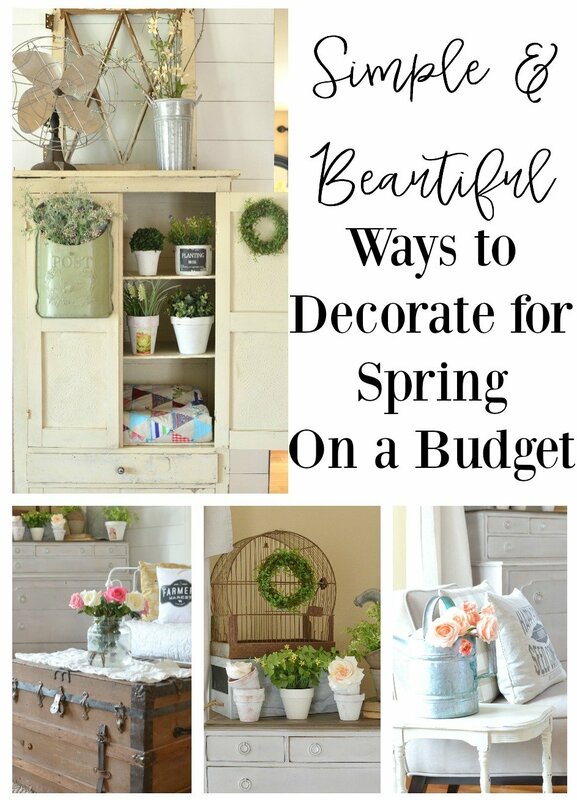 So last week I was changing up some things in our front room and I started thinking of all the simple ways I’ve decorated for spring on a budget. And then I realized that I’m always decorating on a budget. It doesn’t matter what season it is, I’m always looking for ways to save as much money as possible. And it actually doesn’t seem like something I have to think about anymore. That’s just what I do. I’m a thrifter by nature. A bargain hunter. A garage sale connoisseur. Now don’t get me wrong–I’m all about spending money when necessary and investing in quality pieces for my home. That’s actually something I’ve learned over the years–spend more money on big ticket items and figure out ways to save in other places. And thankfully, I’ve discovered a few ways to make that task a bit easier. So instead of just sharing a tour of our front room for spring, which is what I planned to do today, I decided to break it down to show you the simple things I’ve done to decorate this space without spending much money. I hope you enjoy these quick tips and get a few ideas out of it! 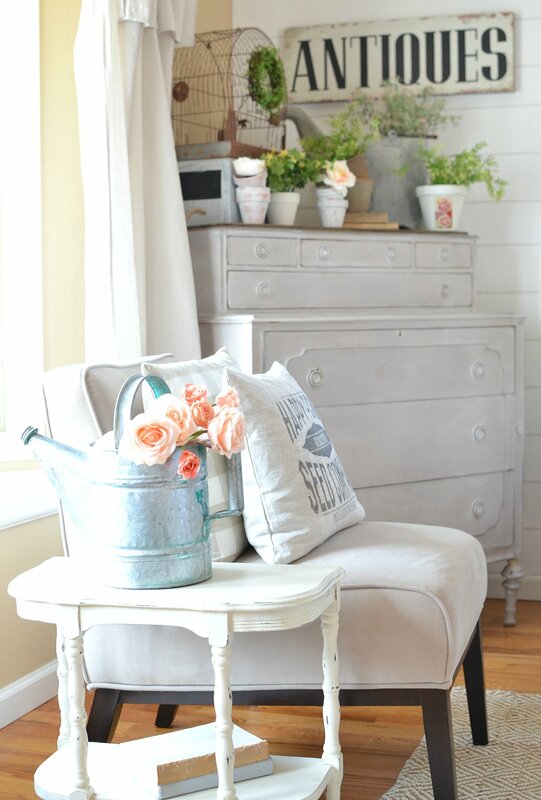 The easiest and most budget friendly way I decorate for spring is to use lots of fresh flowers. But you gotta buy them cheap! For the past few weeks now I’ve been buying discounted fresh flowers at my local grocery store–you know, the ones that are barely starting to droop so they get tossed to the side and slapped with the yellow clearance sticker. That’s where you want to look folks. I recently got a dozen roses for our front room and they were only three bucks. Yep, three dollars. You just can’t beat that. Would you ever think these roses were just $3?! They were originally $20, so that’s a huge savings. Definitely ask your florist where they keep older flowers and always, always check there first before buying anything full price. I bet you’d be surprised what you can get for just a few bucks. You guys know I love Michael’s. Heck, I’m at that place once a week. My husband says I’m addicted, but there’s a method to my madness! I’ve found that nearly every seasonal decor item will go on a huge sale at least once, maybe twice if you’re lucky. I’ve learned that by regularly checking the sales, and waiting patiently for the big ones to hit, I can save tons of money on faux flowers, greenery, and other seasonal decor. For example, just last week I dropped by to check the sales and I was pleasantly surprised to see that the gorgeous faux roses I’d been eyeing for weeks were dropped down to 50% off. You better believe I stocked up while they were so cheap. Patience is key my friends. Also be sure to sign up for email updates or the rewards program at your favorite store. That’s a great way to get coupons–which I use all the time! Here are my faux roses looking all purdy in one of my old watering cans. This whole bundle only cost a few bucks. 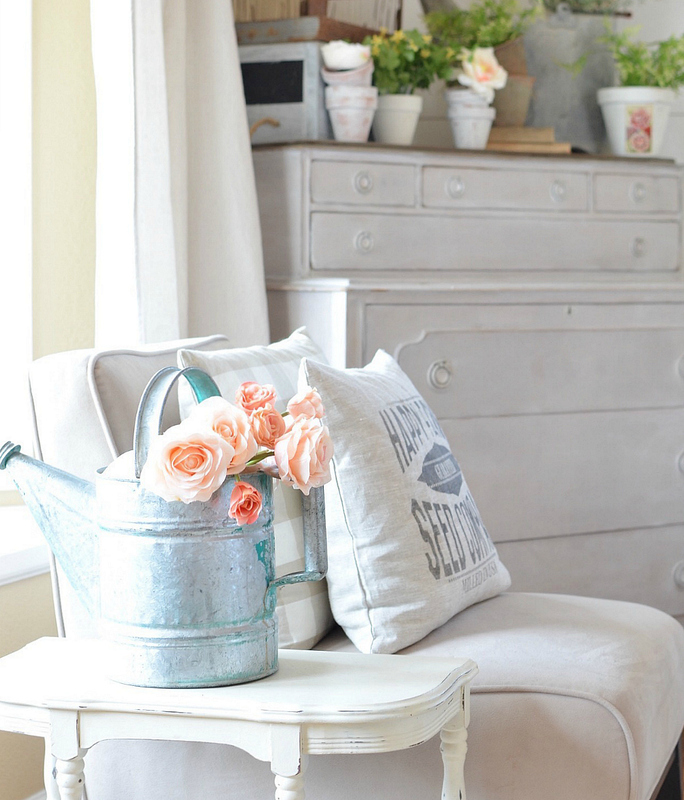 I think every single room in our home has something I’ve DIY-ed to save money and this room is no different. Take these little terra-cotta pots for example. I snagged these from the tool store for less than $1 each, then simply gave them a quick makeover with fresh paint. Nothing fancy, just a little white paint, but I think they’re so pretty stacked together and very inexpensive. Perfect for spring! These are way cheaper than the ones you buy already painted and I think they’re just as cute. So definitely don’t be afraid to DIY it up and save yourself some money. Every little bit counts! When I think of spring I can’t help but be reminded of how it signifies new beginnings and a fresh start. After the long winter months, nature is awakened and life begins to bloom again. That simple concept is really beautiful, so I love the idea of bringing nature indoors as soon as possible. If you’re lucky enough to have your trees blooming already, go outside and trim some fresh greenery. Adding a few touches to your mantel or hutch is a simple (and free!) 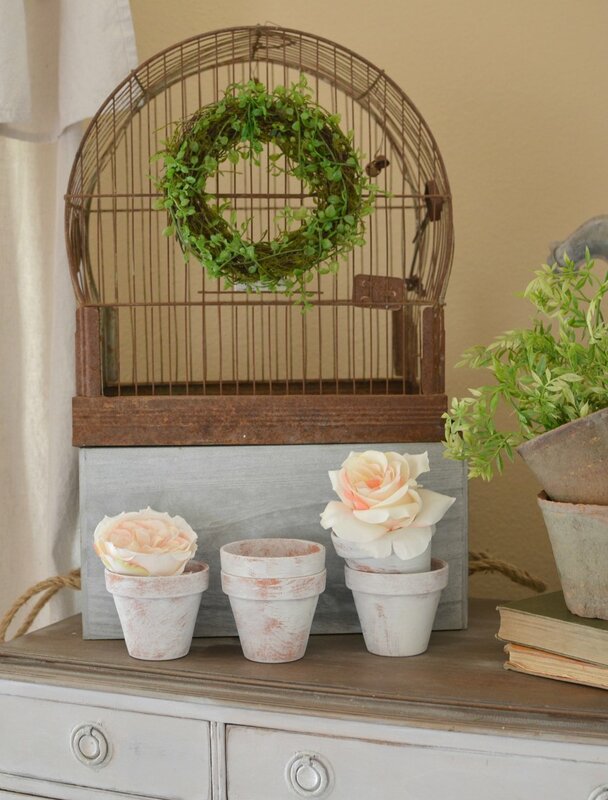 way to awaken your home with a pop of nature. Since we haven’t seen much blooming around here lately, I’ll have to settle for faux greenery for a little while longer. 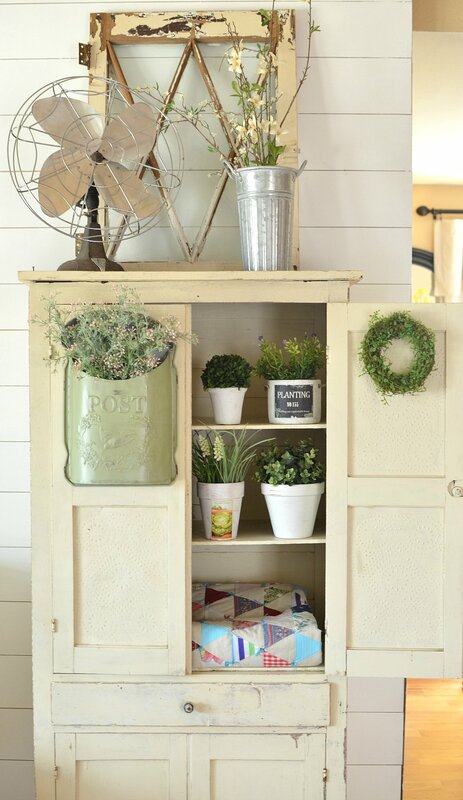 Lots of different shades of green going on here, but I love grouping them all together like this. It makes this vintage pie safe come to life in the most simple, yet beautiful way. 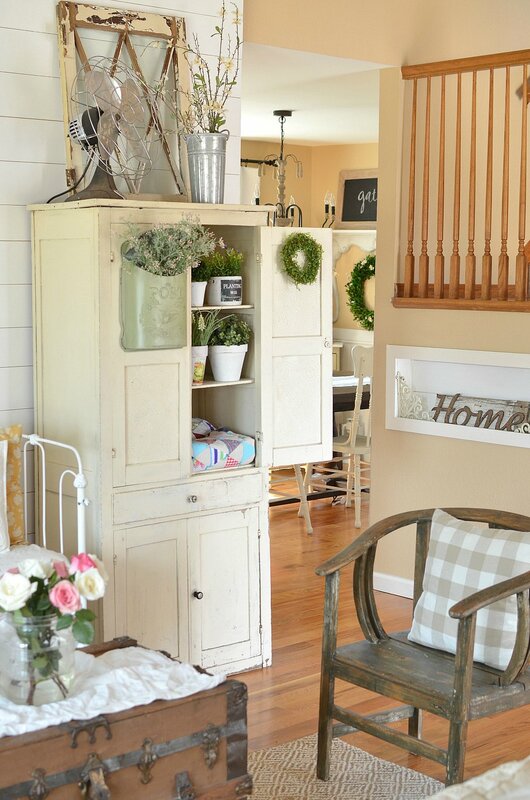 And that’s another tip–look around your home and see what piece of furniture you can turn into a focal point with just a little attention. 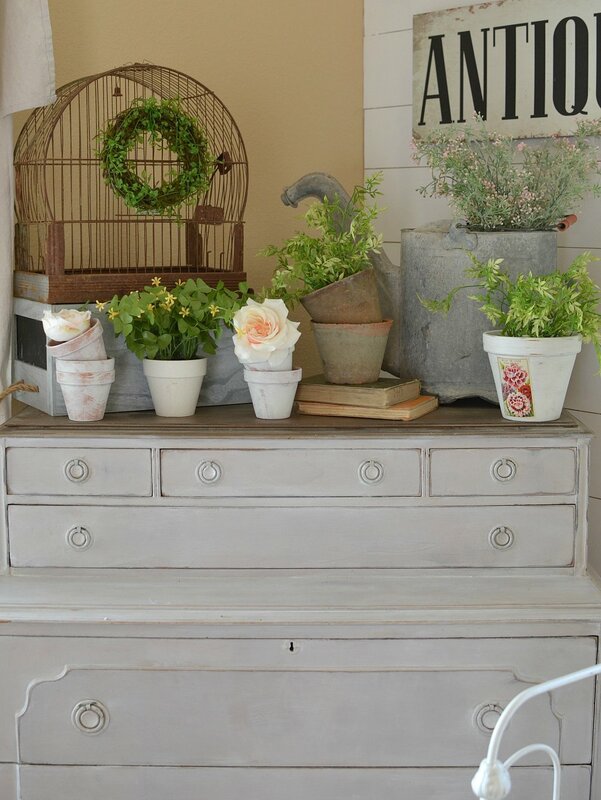 In my post yesterday I told you all that Easter is my favorite holiday, so what I’m about to say probably won’t come as much of a surprise, but here goes–I enjoy decorating for spring way more than I do for Christmas. Gasp! I know, that’s probably not what most of you would say, but it’s true. Spring just speaks to my soul unlike any other time of year. And it reminds me of hope and fresh beginnings. Now don’t get me wrong, I love decorating for Christmas too. 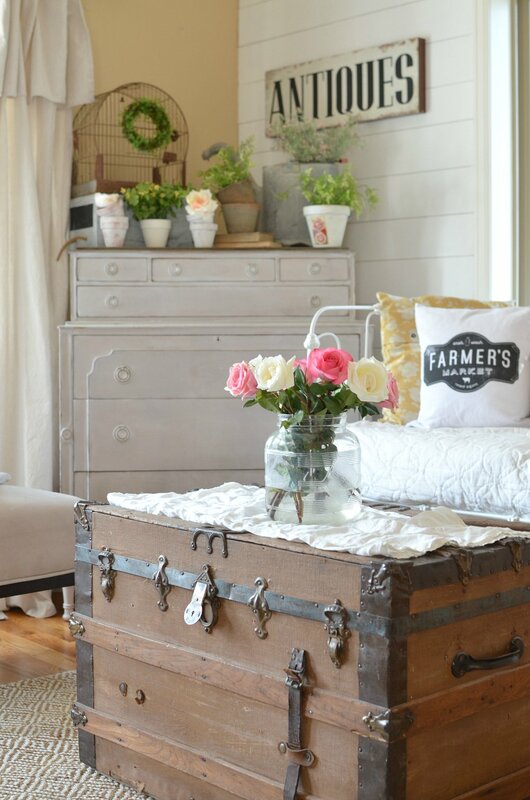 But spring decor is just so darn easy and simple and carefree. Informal and relaxed. I could play around with fresh flowers and greenery all day long and I’d be a happy, happy girl. And I love how you can see God’s grace demonstrated in nature. No matter how cold and dark the winter months may be, spring will always come. The grass will turn green, the flowers will bloom, and life finds new hope. Thank the good Lord for that, right? Well that’s all for me today my friends. I hope you enjoyed reading about the money saving tips and tricks I used to decorate our front room for spring without breaking the bank. Thanks so much for being here, I’m always so glad to have you drop by the blog. Big hugs from me to you! 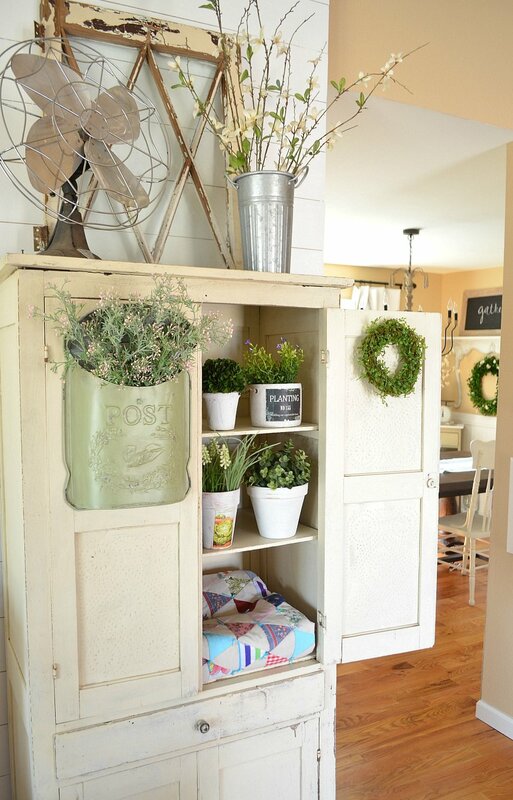 Just noticed that’s not an armoire it’s your great little pie safe ….. even better ! Looks great, as usual. Spring is such a beautiful time. I saw you linked the gingham pillows, because I’m nuts about all gingham things, and realized they are the same ones I’m sitting on my couch with right now. ???? I have the blue ones! I may be “addicted” to gingham. ???? Oh girl, I’m obsessed with those pillows. I have 4 and I only want more! Oh, Sarah!! it is absolutely gorgeous & I love all of your tips!! Thanks for the inspiration. I have been frequenting Michaels and getting great deals! Me too! They seem to have really stepped up their game this year with spring decor and the faux flowers. Love everything, Sarah. I love spring and summer and the air just smells better with all the flowers in bloom and the greenery. I am a Michaels addict too. Love their sales and can’t beat it. Thanks for sharing this great post. ???????? Doreen, you are my kind of gal. I was nodding along with your comment about the way the air smells in spring and summer. I always notice that too and I feel like a weirdo. But it DOES smell different in winter. And not nearly as good! Catching up on blogs (was on vacation, then sick). Really pretty, Sarah. You have a real gift! I too am one of those Spring people, it’s the only thing that gets me thru the winters here! 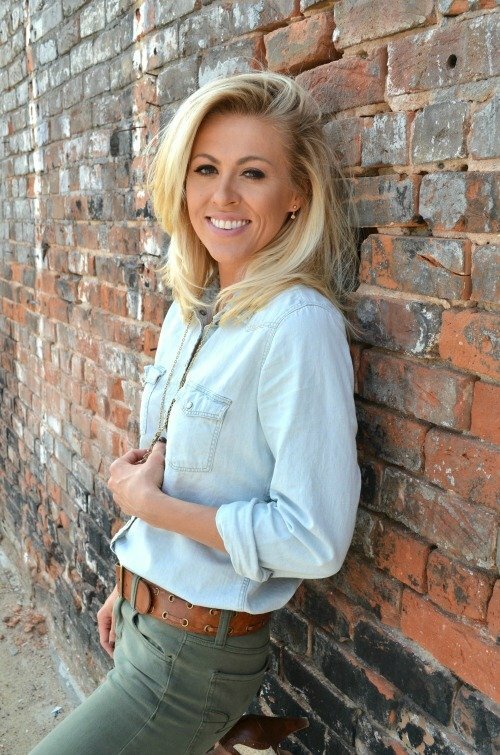 Thanks for the great tips, ideas, and Diy’s you share…Your blog is awesome! Oh you are so sweet Sherri, thank you! And I’m so glad you enjoyed the post! Is that a metal day bed? I love it. Where did you get it? I want ! 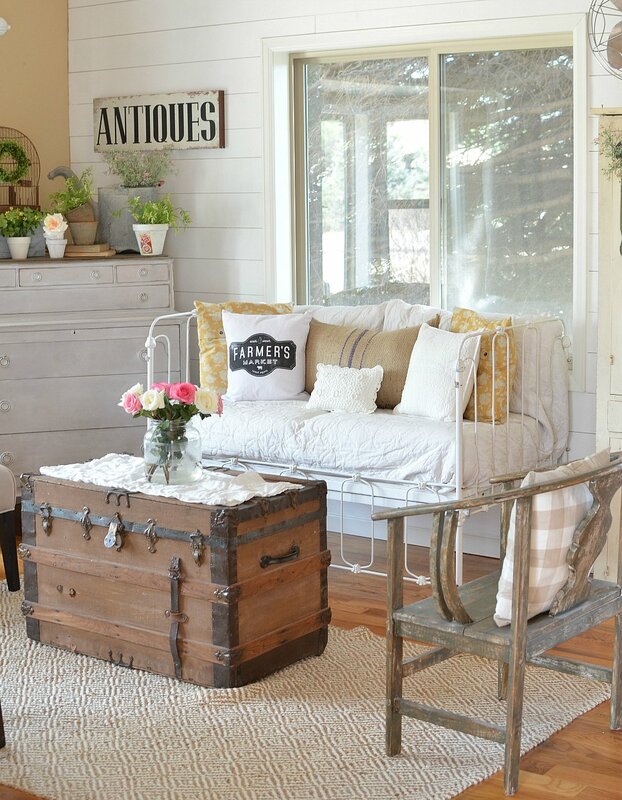 Yep, it’s a vintage iron crib. We got it from a family member who had it for years and years.